Potatoes — most commonly found on tables vegetable. Of potatoes you can cook a huge variety of side dishes, salads, appetizers. 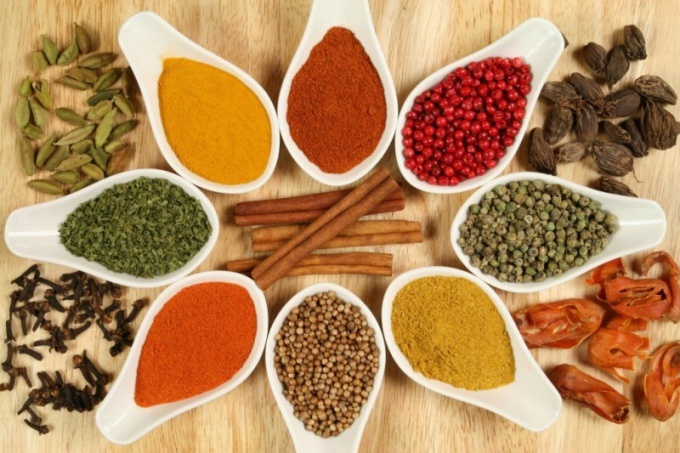 In order to give a unique taste to each particular dish, you should carefully consider the choice of spices and seasonings. Various seasonings are not only able to give the dish a spicy flavor, but also to change the taste drastically. In addition to the traditional salt and pepper, there are a huge number of spices and other natural additives to the potatoes. Wonderful flavor to the potatoes add garlic. Crushed through a press or diced garlic can be added to fried potatoes. And that boiled potatoes had a unique flavor — add chopped garlic in the pan for 5 minutes until cooked meals. If you add garlic immediately after boiling water, the potatoes will not fall apart. Great for potato dishes onions. It is used both when fighting and when roasting or cooking casseroles of potatoes. Green onions sprinkled on the finished dish. Of spices a wonderful addition to potatoes will be turmeric, coriander, ginger, dill, Basil, oregano, thyme, Bay leaf. Using your favorite spices, you can prepare various homemade potato chips. Fresh chopped dill fill potato dishes a summer fragrance and greenery. While the dried twigs of this seasoning will add a touch of delicacy and refinement. Lovers of spicy food will appreciate a variety of ground peppers: black, red, white. The best flavor happens when you use pepper. Grind it in a mill or mortar must be directly in the preparation of potato side dish. However, it is important to comply with the measure if you wish to pepper the dish stronger. Leaves fresh Basil, oregano, marjoram, parsley and even mint will be a great addition to potato salad in the summer. Besides taste and aroma, they will fill the salad with a huge number of vitamins and minerals. And shredded Basil, added to mashed potatoes, not only change the colour of the finished dish, but will also make a very unusual taste familiar dishes. Mint can be useful not only when making salads. Add a sprig of fresh mint in the pot in which you boiled potatoes, and you have an exquisite flavored sauce. Preparing baked in a fat mesh of potato, use as a seasoning rosemary and paprika. If you use in the process of cooking ready spices, which represent a mixture of salt and any spices, then pay attention to the composition. Most often found on the label component such as monosodium glutamate, and various dyes and preservatives. If possible, try to consume only natural dried spices.